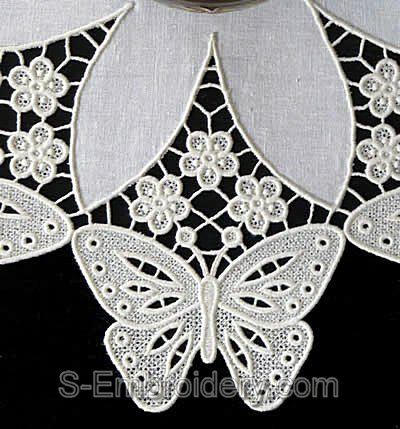 This butterfly free standing lace machine embroidery design comes in 2 variants. The slight difference in size and shape between them will let you create a doily with a different size. 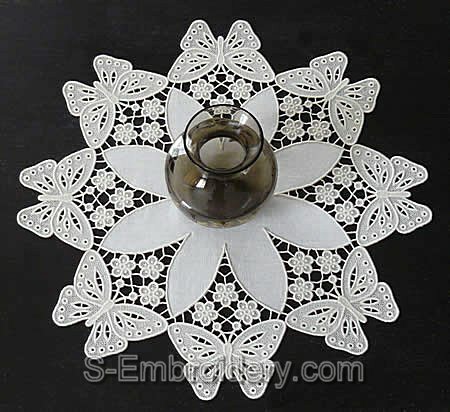 Depending on which of the variants you stitch out you will be able to create a doily with either 8 freestanding lace parts and a diameter of 19 inches (47,9 cm) like the one featured on this page or with 12 parts and a diameter of 25.5 inches (64.8 cm). You receive 2 machine embroidery files in one of the supported formats and PDF files with design information and instructions for creating the doily, shown on our site. An excellent design - stitches out beautifully - even for an inexperienced ME.